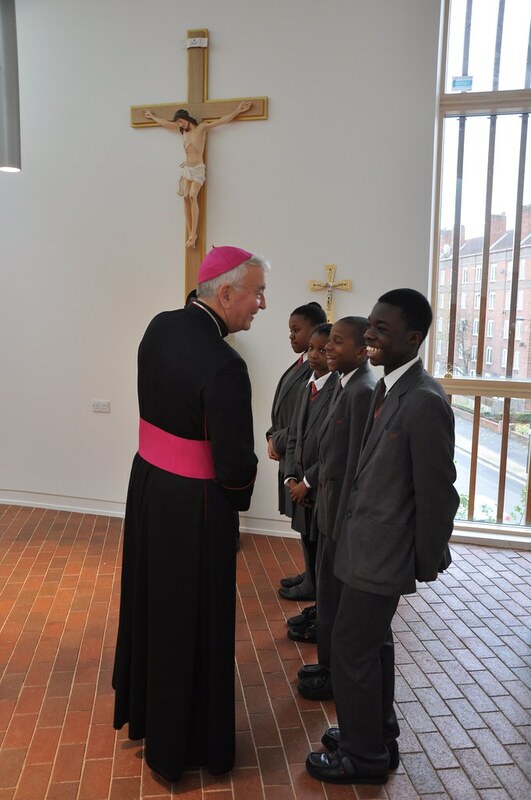 The Most Rev Vincent Nichols, Archbishop of Westminster was at Cardinal Pole School in Hackney on Tuesday 20 October to officially open the new school site on Morning Lane. The new school combines the two previous sites which Cardinal Pole school was based on to provide one building for 11-19 year olds. A change which offers exciting new opportunities for integration and engagement.The new school contains a Chapel, dining room, specialist classrooms for each subject including a suite for special educational needs. It is set within landscaped grounds which include an amphitheatre, playground and outside dining area. In his homily during a Litugy of the Word service, Archbishop Nichols considered the school’s four Saints: Blessed Mother Teresa of Calcutta, St Josephine of Bakhita, St Francis of Assisi and St Thomas More; to whom the school has dedicated a wing of the school. The Archbishop reflected on their lives and said that while they are renowned for their love of the young, poor, animals and the King respectively the greatest love they had was of God. Archbishop Nichols concluded by saying that they represented “four aspects of the call each of us receives from God”, and in our striving to make a difference to the world we should “keep it rooted in God”. Archbishop Nichols went on to bless with baptismal water those who had come to celebrate the opening of the school, images of the aforementioned saints and the building itself. The service also included short speeches from both Executive Headteacher Geraldine Freear and Assistant Headteacher Steve Glover, and a wide variety of songs led by the school choir. Fr Benedict Fadoju, Chaplain of the school, spoke of the excitement surrounding Archbishop Nichols’ attendance as it “really brings in the whole diocese” into the foundation of the school. Spiritually Fr Benedict believes that the new building offers a lot for the students with the chapel being at the centre of the school building. Mass will be celebrated daily at the school, and class Masses and year Masses will take place regularly throughout the year.